You won't need someone else while soldering anymore! "Could you hold it?" is no longer in your dictionary while soldering or mounting pieces! SN-394 is an ideal multi purposed holder for electronic soldering operations and hobby activities. 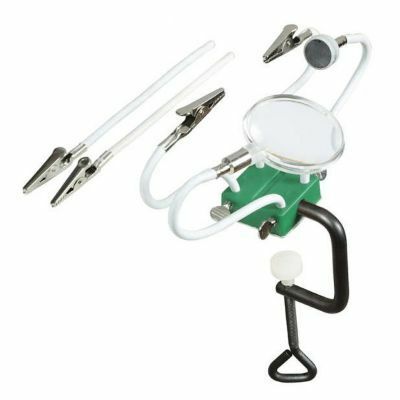 If you wish you can use two crocodile tipped holders or magnetized tips to stabilize your components and use magnifying glass to work on. Also you can it can be banded to right and left easily with its flexible arms and hold your circuits in the position you want. If you are working with metal pieces, you can do the stabilizing with the help of magnetized tip. It can be mounted to tables with Maximum 40mm thickness. It is 4 armed. Magnifying glass, magnet and 2 crocodile arms are included.